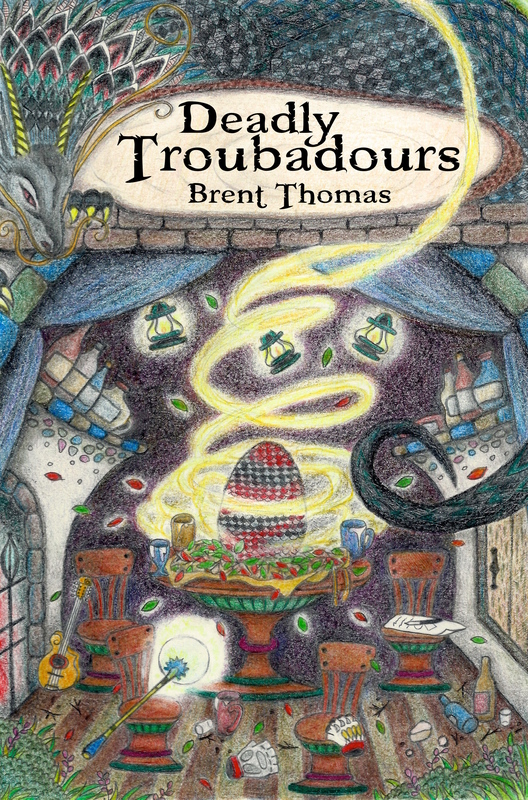 I’ve been hard at work on the sequel to Deadly Troubadours. The current working title is Sand, Sea and Stone. I want to share a little bit of that with you, even though it is way early. But here is the thing, because it is a sequel it does count as somewhat of a spoiler. So, read Deadly Troubadours and then read this. Or read this and then go out and read Deadly Troubadours. Oh, I’m not in editing phase, so there might be some warts in there. It’ll get cleaned up later. I just wanted to share some actual writing. Copper eyes darted back and forth. She sucked in the air, tasting it. Her prey was nearby. Eyes darted once more. Where could it be? She took a few cautious steps forward, her legs finding easy purchase on the soft terrain. She sniffed at the air this time. Her nose confirmed what her mouth had told her. It was nearby. Why couldn’t she find it? It wasn’t to the left or right. She peered behind, ready to spring but there was nothing there to attack. She spat out a little gust of air in frustration. Then it occurred to her. If her prey was not on her level then that left other options. Slowly she tilted her head up. There it is was. Above. Staring down. Her body tensed. It leaned forward. It was about to strike. “Look out! Here comes Mr. Mittens!” Demetrius warned as he crashed the stuffed toy down on his new pet. The baby dragon gave out a squeal as she rose up on her hind legs and grasped at the plush doll. Mr. Mittens was, in fact two mittens filled with fabric scrapes and sewn together. It was more of an amorphous blob than a true animal shape, but it was about the same length as the tiny dragon, ignoring her tail. It was also just big enough around to keep the dragon from getting a good grip around it. When Demetrius let go of the toy it and the dragon, who could not support the combined weight. Toppled to the floor. The little beast continued the wrestling match, unaware that Mr. Mittens was failing to put up much of a defense. Demetrius giggled and clapped, encouraging his new best friend on to victory. Aleksander strummed along with a cheery little tune that would have been at home as orchestration to a child’s puppet show featuring heroic knights. Kestra sat in the chair on the far side of the room glaring with full disapproval at what was happening on the rug. “Three to one. Majority rules,” said Demetrius the words rolling off his lips with easy practice. Kestra continued her glaring. It had been put to vote and she had lost. There had been no argument that hatching the dragon egg had been a damned fool thing to do. The cooing, half grown little beast that had emerged from the egg could have just as easily been a full sized pup with a newborn’s appetite. Had that been the case it would have been questionable that a weakened Demetrius would have survived the encounter. But he did and brought the little creature home eager to show his friends. The friends were in turn shocked at the appearance but were not very surprised by the action. Just before bone-exhaustion had claimed all four of them, three of the Deadly Troubadours had discussed the possible necessity of keeping the egg from the already snoozing Demetrius. Unfortunately, sleep had claimed them before a best course of action could be decided upon. And Demetrius had awoken in the middle of the night. When he returned and the others woke there wasn’t even an argument, just a feeling of communal missed opportunity. But a vote had been agreed upon. Kestra clearly stated the beast was too dangerous and needed to be dealt with. Demetrius said it was adorable and should stay as a mascot. Talbert felt the chance to first hand see the growing patterns of an infant dragon was too valuable to pass up. Aleksander imagined their untimely deaths would make an excellent song, especially if he survived to perform it. A pet dragon was the result. The tiny dragon was on top of Mr. Mittens and biting into it while giving little shakes of her head. The dragon’s teeth had yet to grow in so it more gumming Mr. Mittens, but the intent was clear. “Cats do the same thing. Most people find them adorable,” countered Demetrius while giving Mr. Mittens a little shake. “Cats typically don’t grow as big as houses and spit fire,” offered Kestra. “I had a pet,” Kestra said rolling her eyes. “That wasn’t gladiators. It was legion soldiers,” she told him. This was Demetrius turn to roll his eyes as he went back to playing with his dragon. Wasn’t that great! I dig it. Tell your friends.